The humanoid robot commonly known as “Pepper“ is the latest employee to be hired by TUI Nordic. Pepper, named Pepper 2E, will work as a Robot Assistant and be a part of TUI’s new Data Analytics and Machine Learning team. TUI is the first travel company in the world to incorporate robotics in this way. “Automation, AI and Robotics are important elements of TUI’s future. We already have some of the best specialists in this field and I am excited to see how Pepper 2E will contribute to our team. And most importantly, I hope he sparks curiosity and engagement with all of our TUI Nordic colleagues”, says Alexander Huber, Managing Director of TUI Nordic. Pepper 2E started on August 14, 2018 and will primarily be based in TUI’s Stockholm office. The humanoid robot has a detailed job description as well as set “personal” goals he will be evaluated on, just as any regular TUI employee. The main responsibility of the Robot Assistant is to inspire innovation, curiosity and technological pioneering. Furthermore, the Robot Assistant will help visitors as well as colleagues and external customers with everyday questions and problems. As a true TUI employee, Pepper 2E will go through the usual steps of onboarding. He has a manager to report to and is member of a team that will incorporate him in their day-to-day tasks. He will spend the first few months hovering around the office getting to know the company and his new human colleagues. Pepper understands and speaks in numerous languages and can understand human emotions. Pepper’s touch screen increases his capacity to interact and enables him to enhance communication by providing visual information. With entirely programmable platforms, Pepper offers manifold usage possibilities to enrich the experience. TUI fly’s sustainability strategy remains on its successful path. This is demonstrated by this year’s progress report on TUI fly’s environmental statement, providing information on the progress delivered by the environmental programme in the framework of EMAS (Eco-Management and Audit Scheme) certification. Average jet fuel consumption was reduced to 2.52 litres per one hundred passenger kilometres. Moreover, the independent climate protection organisation atmosfair again rated TUI fly as Germany’s most climate-efficient airline. Its overall global rating is also remarkable: TUI fly has again been named one of the world’s top airlines, ranking third on the global list. The pole position is held by its British sister airline TUI Airways. “Our flights are already 27 percent more climate-efficient than those operated by the six largest European airline. We are committed to continuing these efforts in order to further optimise the climate efficiency of our flights. We thus render a significant contribution towards delivering TUI Group’s “Better Holidays, Better World” sustainability strategy, aimed at reducing the ecological footprint and promoting people and regions in the destinations”, said Roland Keppler, CEO TUI fly. Numerous measures have also been launched on the ground to ensure environmentally-friendly operations. In this context, TUI fly has now launched charging stations for electric vehicles at the employees’ car park at the head office – in cooperation with the energy utility Enercity. “In order to ease the start into e-mobility for our employees, they can charge their electric cars free of charge at these stations. We will also convert our vehicle fleet. To that end, we are currently exploring the launch of electric vehicles for aircraft maintenance at the apron,” said Roland Keppler. TUI fly’s environmental programme includes measures for 18 destinations. It ensures the continuous transformation to more environmentally friendly operations covering all business areas. The new Boeing 737 MAX aircraft (above) launching in 2019 will contribute towards that goal. 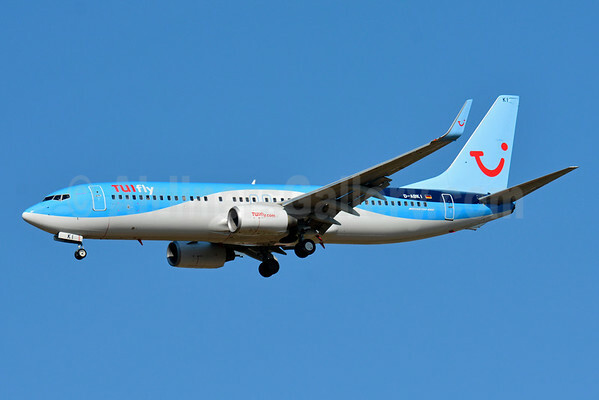 TUI Group already operates five aircraft of the latest generation of 737s. At 16 percent, they have even exceeded expectations regarding fuel and emissions savings. This entry was posted in TUI Group, TUIfly, TUIfly Nordic and tagged TUI Nordic, TUIfly on August 25, 2018 by Bruce Drum. Atlantic Star will partner with TUIfly to deliver its 2016 charter flight program between the UK and St. Helena. TUI Group is Europe’s largest travel company and holds a European Air Safety Agency Air Operators Certificate, including the necessary Extended Twin Operations validation necessary to operate to St. Helena. TUIfly will operate a Boeing 737-800 on the route from London Gatwick to St. Helena, via a short fuel stop in Banjul, Gambia. The two-class configuration will offer Economy and Economy Plus seating options. The first dates for travel coincide with the Easter school holidays. They will of course be dependent on the airport at St. Helena being opened on schedule in February 2016. Further flights are planned, timed to coincide with school holidays later in 2016. Atlantic Star will not be able to confirm the dates or release tickets for sale on these services until much nearer the time. The first service will leave London Gatwick in the late evening of Sunday, March 20, 2016, arriving mid-morning in St. Helena on Monday, March 21, 2016. The aircraft will then leave St. Helena around lunchtime, to arrive back in London Gatwick late the same night. The second service will operate to a similar schedule, leaving London Gatwick on Sunday, April 3, 2016 to arrive in St. Helena on April 4, 2016, departing St. Helena the same day to arrive at London Gatwick late that night. Copyright Photo: Paul Bannwarth/AirlinersGallery.com. TUIfly’s (TUIfly.com) (Germany) ex-Airberlin Boeing 737-86J WL D-ABKI (msn 37748) arrives at EuroAirport. This entry was posted in Atlantic Star Airlines, TUIfly and tagged 37748, 737, 737-800, 737-86J, Atlantic Star Airlines, Basel/Mulhouse/Freiburg, Boeing, Boeing 737, Boeing 737-800, BSL, D-ABKI, TUIfly on October 30, 2015 by Bruce Drum. TUIfly (TUIfly.com) (Hannover) is planning to introduce a new Haribo logojet. According to the Haribo website, there will be a new logojet named “Haribo Tropifrutti”. You can also win a free trip to New York via Newark Airport on this airplane together with Thomas Gottschalk (the most popular showmaster in Germany and currently the “face” of Haribo commercials), starting on April 25 which is also the first flight of this new logojet. 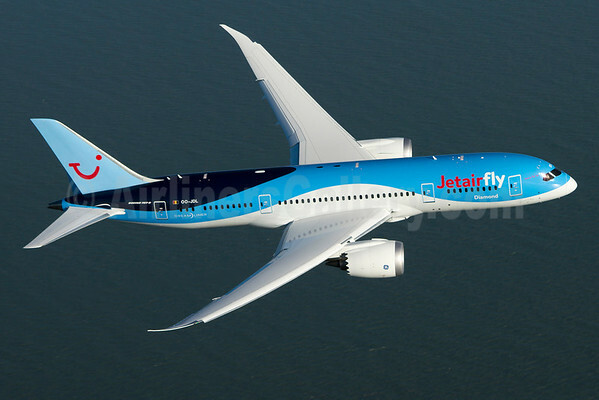 The routing will be Cologne/Bonn – Keflavik – Newark. Haribo (Bonn) is a German candy company, founded in 1920 by Johannes (“Hans”) Riegel, Sr. The Haribo name is formed from Hans Riegel, Bonn. This will be the third TUIfly Haribo logojet. Above Copyright Photo: Ton Jochems/AirlinersGallery.com. 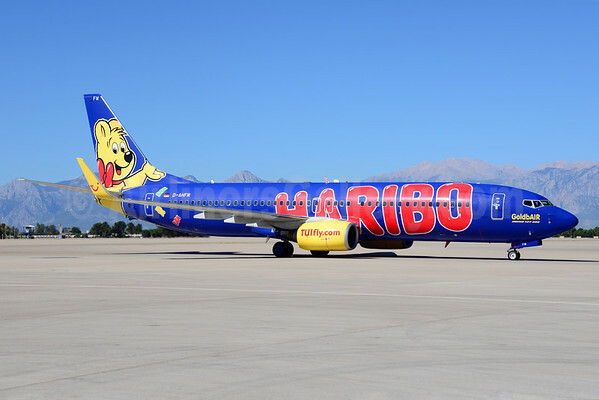 The original Haribo design was introduced in 2008 on the pictured Boeing 737-8K5 D-AHFM (msn 27986) at Antalya. Above Copyright Photo: Paul Bannwarth/AirlinersGallery.com. 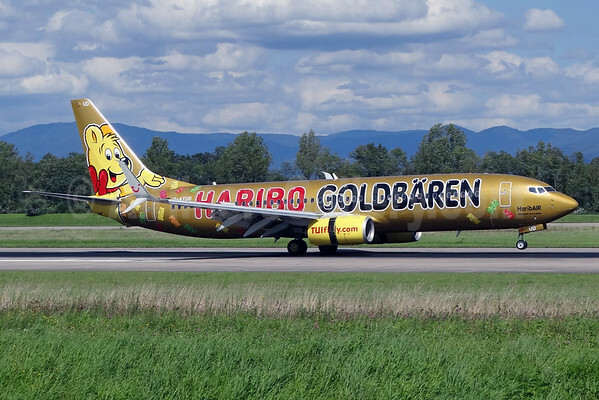 The second Haribo logojet, the pictured Haribo Goldbaren, was introduced in 2010 on the pictured Boeing 737-8K5 D-ATUD (msn 34585) landing at EuroAirport. This entry was posted in TUIfly and tagged 27986, 34585, 737, 737-800, 737-8K5, Boeing 737, Boeing 737-800, D-AHFM, D-ATUD, Hans Riegel, Haribo, Haribo Goldbaren, Haribo Tropifrutti, Newark Airport, Thomas Gottschalk, TUIfly, TUIfly Haribo logojet, TUIfly.com on January 25, 2015 by Bruce Drum. The island of Madeira, was buffeted by a cold front, a storm that lasted several days, from Thursday until Monday night, many flights were cancelled or diverted for the nearest airports. This entry was posted in TUIfly and tagged island of Madeira, Madeira, TUIfly on October 26, 2014 by Bruce Drum. TUIfly‘s (Hannover) parent, TUI AG (TUI Group) wants to cut costs at the German airline subsidiary by 65 million euros ($88.9 million) each year by cutting back on free services for passengers and lowering staff costs according to the daily Sueddeutsche Zeitung and this report by Reuters. The new cost savings program is called “Max Thrust”. TUIfly will expand the fleet by four new aircraft for medium-haul flights and two planes for long-haul operations according to the report. Tuifly plans to divide its cabin into three classes from May and stop offering free newspapers, inflight entertainment and blankets according to the report. In another report by Romania-Insider.com, TUIfly is also considering moving 350 maintenance jobs to Romania in order to reduce costs. Copyright Photo: Paul Bannwarth/AirlinersGallery.com. TUIfly will reportedly drop its trademark yellow canary fuselages for the new TUI Group blue brand. Boeing 737-8K5 WL D-AHFY (msn 30417) lands at EuroAirport serving the Basel/Mulhouse/Freiburg area. This entry was posted in TUIfly and tagged 30417, 737, 737-800, 737-8K5, Basel, Basel/Mulhouse, Basel/Mulhouse/Freiburg, Boeing, Boeing 737, Boeing 737-800, BSL, D-AHFY, EuroAirport, TUI AG, TUI Group, TUIfly, TUIfly Germany, TUIfly.com on January 24, 2014 by Bruce Drum. TUIfly (TUIfly.com) (Hannover) will launch new long-haul leisure routes from Hamburg in November to the Caribbean. According to Airline Route, twice-weekly flights will be started to Barbados on November 22, Cancun on November 2, La Romana on November 29 and Punta Cana on November 1. 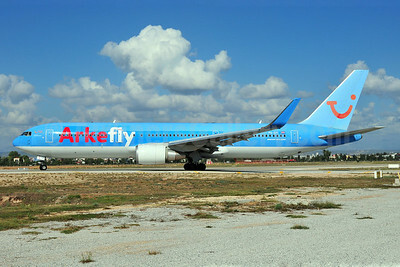 The four new routes will be flown by TUI partner airline Arkefly (Amsterdam) Boeing 767-300s. This entry was posted in Arkefly, TUIfly and tagged 29138, 767, 767300, 767304, Antalya, Arkefly, AYT, Boeing, Boeing 767, Boeing 767300, PHOYI, TUI Airlines Nederland, TUIfly, TUIfly Germany on July 14, 2013 by Bruce Drum.